The move to double the threshold for goods and services tax (GST) registration to annual turnover of Rs 40 lakh may result in up to 60% of the registered dealers falling out of the net, but will have only a negligible impact on revenue. At the end of last March, there were over 87 lakh registered dealers with nearly 45 lakh reporting around Rs 20-lakh turnover. Another 10 lakh had a turnover of up to Rs 40 lakh, data accessed by TOI showed. 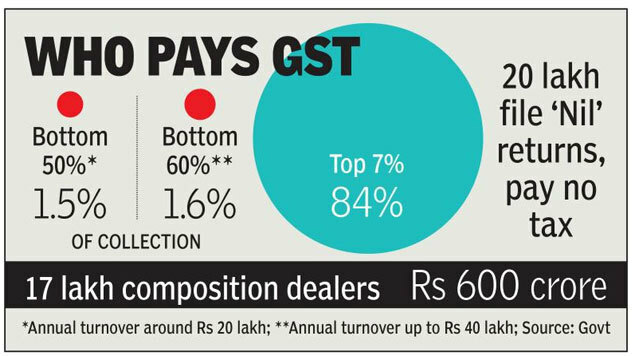 Officials said that the trend is largely similar although the base of registered GST payers is now close to 1.2 crore. Officials said that not all the registered dealers would opt out as several of the companies that they sell to would want them to be part of the net to avail of credit paid in various stages of production. The GST Council is scheduled to discuss a plan to increase the registration threshold, which the law committee had proposed should be Rs 40 lakh, although states such as Bihar had suggested that it should be raised to Rs 50 lakh. The move was discussed at the last meeting as part of a plan to ease the compliance burden on small businesses . Officials are, however, not fully convinced about the need to increase the threshold, especially for smaller states, where the turnover is lower. In fact, before the launch of GST, the hill states had opted for a lower threshold of Rs 10 lakh to ensure that the tax base does not shrink, impacting their revenue. While Bihar has floated a proposal for presumptive tax for those with a turnover of Rs 50-75 lakh, some of the states are seeking a facility for smaller taxpayers, arguing that they are the ones who need it the most. Besides, officials said, it will do away with the need to increase the threshold, something that was backed by a ministerial panel headed by junior minister for finance Shiv Prakash Shukla on Sunday. The other worry is regarding allowing composition scheme for service sector — where only quarterly tax payments based on turnover will have to be made. Officials fear that this will result in widespread misuse and yield little revenue.